Isaac Darche began his musical training at age 9. 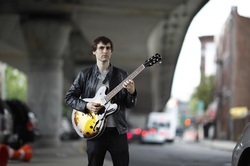 He earned his degree in jazz performance from UCLA in 2006, studying under jazz legends Kenny Burrell and Billy Higgins as well as classical guitarist Peter Yates. Isaac moved to New York in 2006. He has had the opportunity to perform with many great musicians including Keith Carlock, Sean Wayland, Mark Ferber, Randy Ingram, Jochen Reuckert, Mark Shim, Jon Gordan, Curtis Fowlkes, Lucas Pino, Leron Thomas, Henry Cole, Yvonnick Prene, Ambrose Akinmusire, Linda Oh and many others. He has performed at many of New York's top venues including the 55 Bar, the Garage, Fat Cat and the Stone. Isaac has received numerous distinctions and critical plaudits. His recent album "Boom-bap!tism" (BJUR) was named to "Top 10 of 2012" by NPR and WGBO radio. He has a Gluck Performing Arts Fellowship, and recognition from the Kennedy Center and the Thelonious Monk Institute. He is endorsed by David Bunker Guitars. Isaac has been teaching professionally for 8 years. In addition to numerous private students, Isaac taught at the Mike Risko Music School from 2006- 2010 and the Long Island City YMCA from 2008 to the present. Including group classes, Isaac has taught over 500 guitar students in New York City.